This is the first of three paintings Trego did based on the famous poem by American writer Lucy Larcom (1824–1893), Hannah’s at the Window Binding Shoes. Larcom’s sentimental poem about the unfortunate Hannah, whose young husband was lost at sea, had been read in many a parlor and studied in countless classrooms in late nineteenth-century America. It had also been set to music as a popular song. 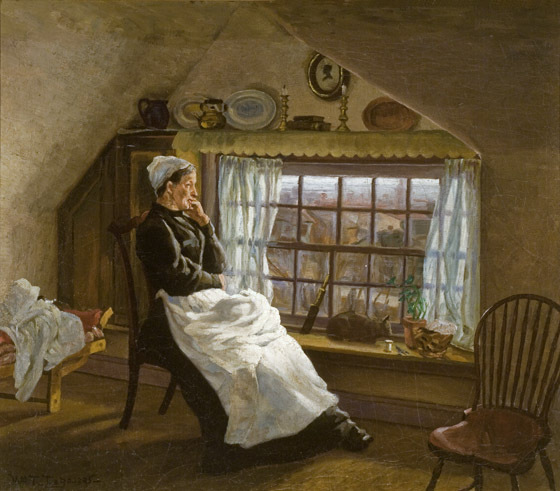 In all three versions of his painting, Trego showed Hannah as the old woman described in Larcom’s piece—“faded, wrinkled, sitting, stitching, in a mournful muse”—looking up from her work to gaze out the window at the sea, still waiting, decades later, for her husband’s return. In this first version, which does not show her actually binding shoes, the cot behind Hannah suggests that this is her entire living space. A miniature profile portrait, perhaps of her lost husband, is mounted on the wall above the window, and a small telescope, a symbol of her constant hope for his return, leans against the window. A sleeping cat and a small plant on the windowsill seem her only companions. A spool of thread on the sill reminds us of her shoe binding work. Aside from the portrait of his father, this was Trego’s first non-military painting of his professional career. It is the first of the series of genre paintings he created toward the end of his career to supplement his income. Despite the inscription on the back, the identity of his model remains unknown. Sold at auction, Frank S. Schwartz Gallery, Philadelphia, 1988, to the current owners.